Spanky is a darling 10 month old little boy who has had a rough life so far, to say the least. He came to FARM with his mom Spooky after being in a deadly house fire. He was just a young kitten at the time. From there, he was at animal cont rol, and then went on to a foster home. To make matters worse, this little baby was missing an eye when we got him, and was suffering from an infection where his eye used to be. We had him neutered, had his eye socket flushed, and sutured closed to prevent further infection. He is current on all vaccines. As you can imagine, he is a bit shy, but such a little sweetheart! 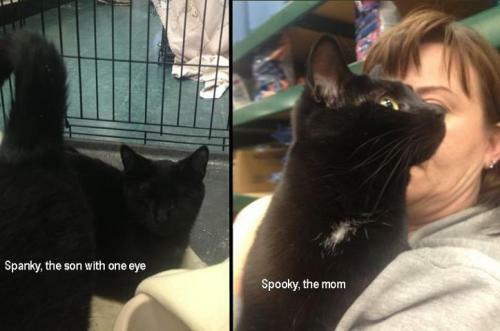 He is very bonded to his mom Spooky, so they must be adopted together. They are currently living at Feed Plus and when Spanky was in his foster home, he was able to come out of his shell. Please share, or if you think you can provide Spanky and his mom the loving, safe and stable forever home they deserve, come by and meet them at Feed Plus! I just tweeted this post and I posted it on our Fan page on Facebook. Hoping we can help find these adorable babies homes! Thanks, Caren and Cody!! We appreciate it! !